The global energy market fundamentally enables the modern economy to function. 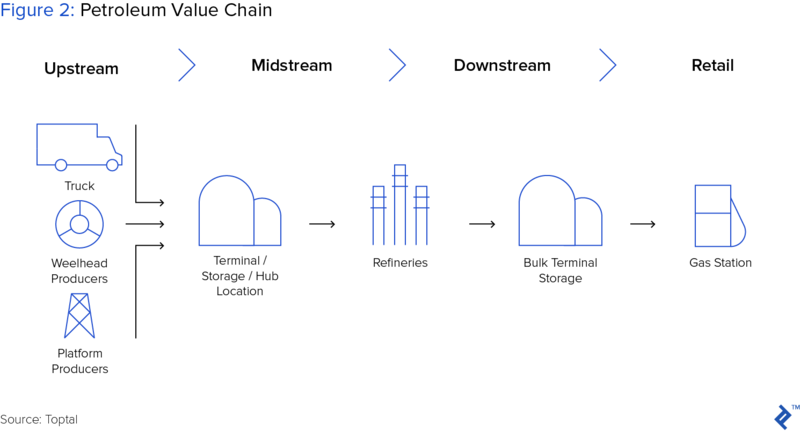 Soon, the processes enabling energy commodities to flow from source to customer may be transformed by blockchain energy applications. Recent partnerships between leading multinational oil, gas and utility companies and blockchain innovators foreshadow a new frontier for energy. 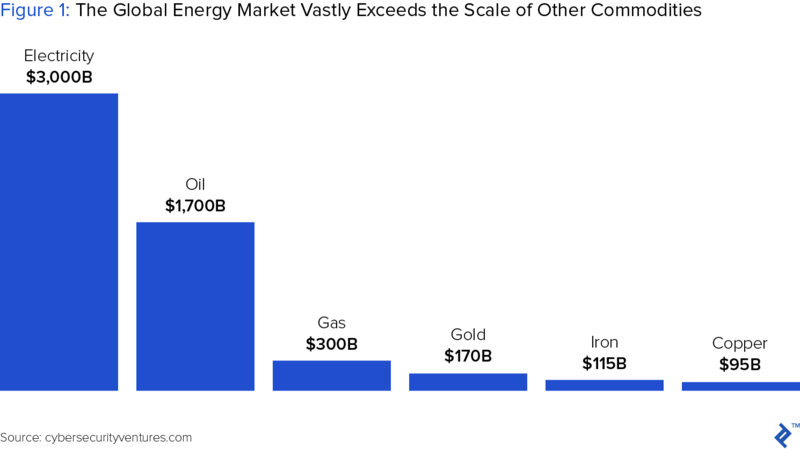 In terms of total dollar volume and economic impact, few industries surpass the scale of the global energy market. The global value of oil, natural gas, and electricity amount to $5 trillion annually, vastly surpassing other raw materials commodities. Energy can be broadly divided into two categories: fossil fuel-related products, and electricity. Within the fossil-fuel category, exploration & production, refinery, transportation and retail companies manufacture and transport various oil-derived products from the ground to end-user. Within the electricity category, generation and transmission companies create and deliver electricity to end-users. As with other highly-regulated, transaction-intensive industries such as banking, structural elements that underpin the energy industry are well-suited for blockchain application. In our first article, we profiled two use-cases: trade finance and supply chain traceability. In each case, multiple parties orchestrated complex transactions and information flows. To streamline transactions, they developed blockchain applications, which reduced cycle time and errors, provided higher transparency, and ultimately, lowered cost. Early blockchain applications in energy combine aspects of both use cases, as they target supply chain efficiency and multiparty financial transactions. Similar to most enterprise blockchain applications, those covered in this article rely on permissioned ledgers, which differ fundamentally from popular public blockchains, such as Bitcoin, because they are not accessible to everyone. Instead, a designated administrator dictates user access and information rights. In an approach similar to consortia, which we also covered in our first article, blockchain innovators are organizing groups of industry participants with common interests, and orchestrating efforts to build new products that will replace underperforming legacy systems. Within the oil & natural gas markets, vast supply chains interlink to discover, extract, refine and distribute product to end customers. To coordinate energy trading activities across the network of counterparties, companies employ energy trading and risk management (ETRM). ETRM refers broadly to the workflow that underpins commodity trades, and specifically to the software that enables information flow. ETRM supports energy trading across a wide range of commodity markets, including crude oil, refined products, natural gas, and electric power. Within each segment, a multitude of participants - including companies that produce, refine, distribute and retail - trade information related to pricing, position management, logistics and risk reporting. While the global market for ETRM software generates a relatively modest $1 billion of annual revenue, its impact is outsized, influencing trillions of dollars of energy resources annually. With global oil & natural gas exports, alone - a conservative estimate of the total notional value impacted - ETRM directed $855 billion of commodity flow in 2016. 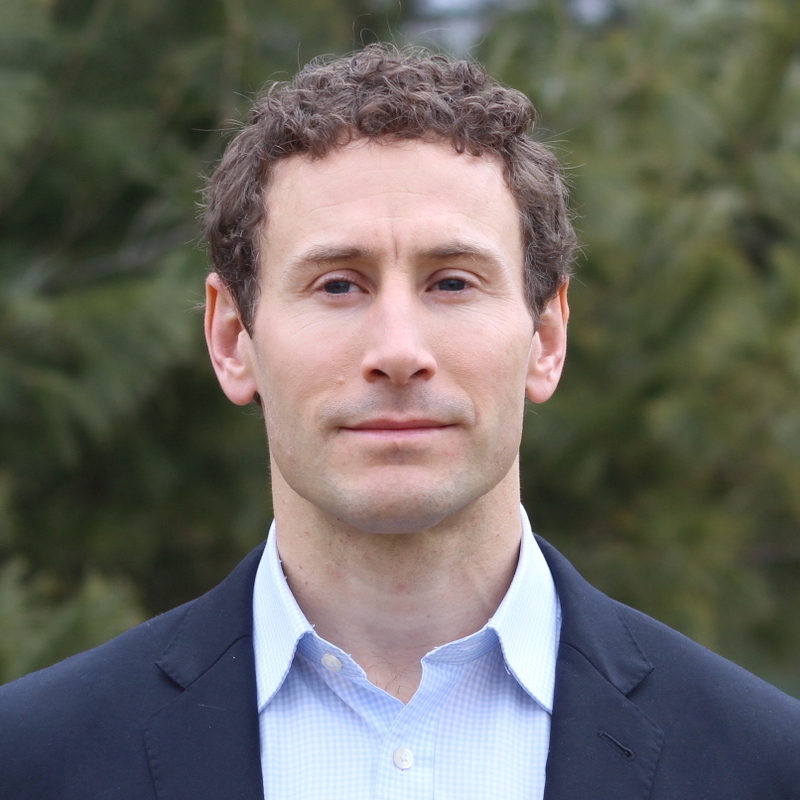 In a simplified energy trade, as highlighted by a recent article from the Cleantech Group, Buyer and Seller initiate the transaction. Both parties confirm the commodity price by consulting the relevant price exchange, for example the CME for West Texas Intermediate crude oil. Then, working through an online exchange or a broker, Buyer initiates the purchase. After settling the trade, both Buyer and Seller enter transaction details into their ETRM systems, then send identical information to their broker and each other, confirming the trade and ensuring information matches. The data reconciliation step often relies on emailed spreadsheets, or some other manual cross-check, which increases transaction time and vulnerability to human error. With the above in mind, industry participants have started turning to blockchain as a way to improve and render more efficient the ETRM systems orchestrating trading activity. Accordingly, several promising pilots are underway to explore how blockchain applications can overhaul these systems. In a leading example, Blockchain Technology Group (BTL) recognized a familiar pattern of transaction inefficiency witnessed in banking. As a result, they adapted technology originally piloted with Visa and several European banks in 2016. In that pilot, BTL’s Interbit blockchain system helped banks more efficiently transfer money across international borders, offering a potential alternative to incumbent systems such as Swift. Building on the finance pilot success, BTL positioned Interbit to serve two needs unique to oil and gas customers: privacy and speed. To optimize for these needs, BTL built a proprietary blockchain. Though similar in structure to popular versions such as bitcoin and Ethereum, Interbit is a unique, permissioned ledger. By comparison, a blockchain such as Ethereum would put all customer data in one place, whereas Interbit creates a unique blockchain for each bilateral customer relationship. Each of these blockchains, in turn, connects to a master blockchain. As a result, the Interbit structure creates a more flexible permissioned system, in which BTL grants information access solely to transacting counterparties. BTL also optimized Interbit for speed, recognizing unique scalability needs of its customers. Unlike bitcoin or Ethereum, which can only process 7 and 15 transactions, respectively, Interbit can process 100,000+ transactions per second. 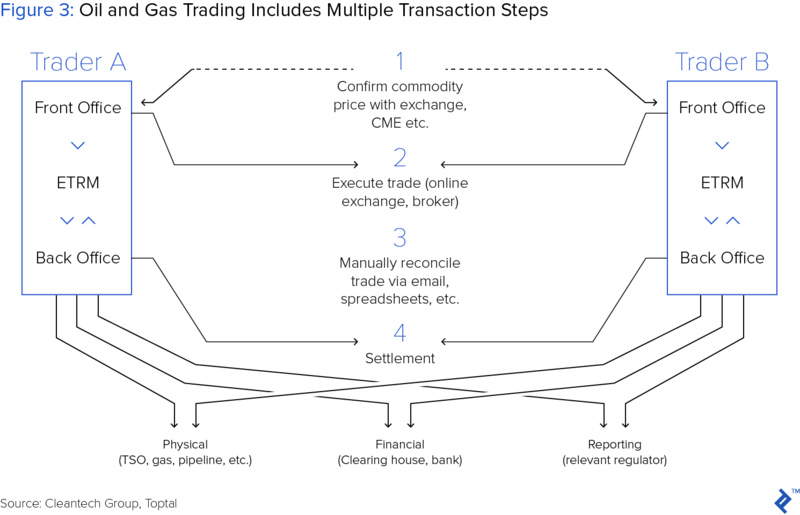 BTL first targeted gas trading, where legacy process relied on cumbersome document trading. As customary practice, buyers generate a nomination - a request for a physical quantity, at a specified price, delivered to a specified point - to the upstream seller. The nomination is often emailed as an attached PDF to all operators participating in the transaction. Once these parties receive the nomination, they enter the data into their ETRM software. However, nominations are often updated, requiring all participants to subsequently search through the updated PDF to locate new information and repeat the manual data entry process. Although notionally simple, the manual reconciliation process is practically complex and costly, requiring multiple days or months to complete. Further, transaction time increases when trading parties are not subsidiaries within the same company. Long settlement times translate to higher cost, as counterparties must allocate trade collateral in the form of committed capital, which is only freed up once the trade is settled. While blockchain holds great potential to improve ETRM systems, transitioning to this new technology is complex and should be done carefully. 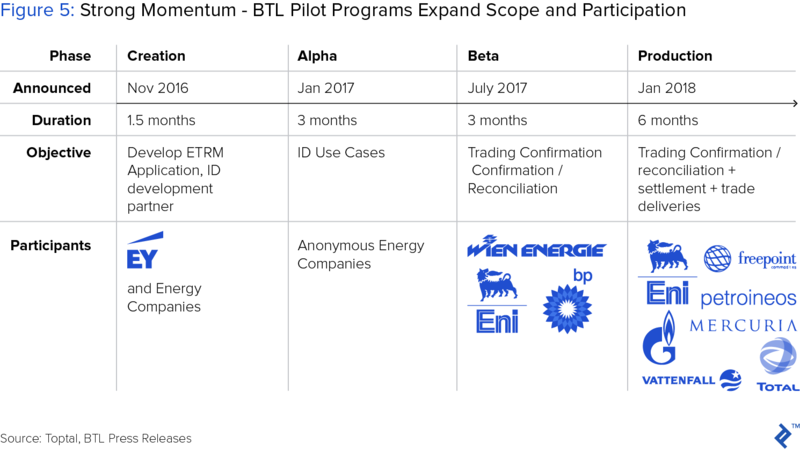 Continuing with the BTL example, the company pursued a measured approach over the past 2 years, launching a series of pilot programs with diverse global energy companies. With each successive pilot, BTL built on prior success, expanding scope and the number of innovation partners. In a strategy reminiscent of blockchain consortia covered in our first article, BTL efforts orchestrated strategic objectives from multiple parties with a shared interest - in this case, more efficient energy trading. The theme of building upon early success, particularly by drawing more industry partners, echoes the trajectory of blockchain developments in other industries, such as the food supply chain. In each vertical, as additional partners contribute resources and product feedback, the solutions under development will undoubtedly strengthen. In addition to oil & gas, the electricity market holds great potential for blockchain applications. Renewable energy, in particular, introduces market dynamics that are well-suited for the distributed ledger. As a growing electricity source, renewables should increasingly influence utilities and customers to adopt blockchain-based solutions that improve market efficiency. Although renewables only account for about 10% of global electricity generated, they are rapidly displacing fossil fuel generation. In 2017, new investment in renewables accounted for more than 50% of new generation capacity added. Several drivers are pushing renewables to the forefront. Installed cost has plummeted, with wind turbines falling 30% and solar panels 80% since 2009, according to the the International Renewable Energy Agency. Increasingly, lower installed cost enables renewable energy developers to bid competitively against fossil fuel generation, often without government subsidy. As the electricity generation mix becomes increasingly distributed, particularly in the form of residential and small commercial solar installations, new opportunities arise for electricity supply and demand to meet. With growing networks of distributed generation and net metering capability, consumers now have the ability to more directly monitor and control their power consumption and production. 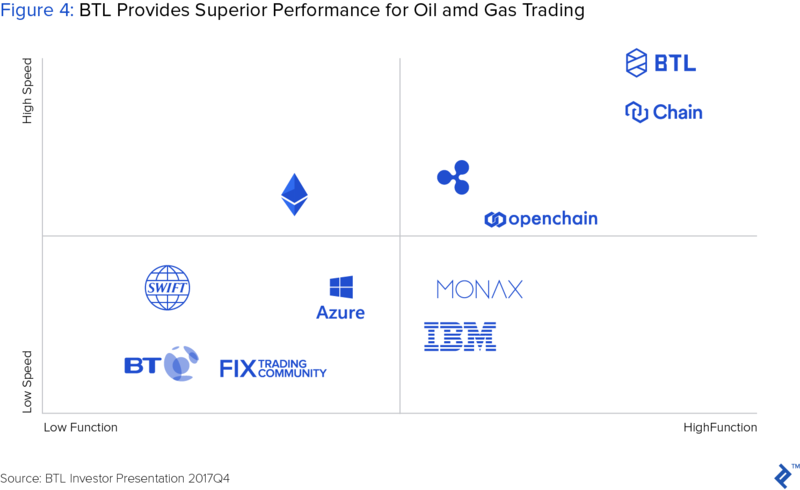 As with oil and gas, electricity trading poses a compelling use case for blockchain. Similarly, electricity trading occurs between a variety of counterparties who stand to benefit from a shared ledger of trading activity. The burgeoning peer-to-peer energy market is already deploying blockchain to improve transaction economics for buyers and sellers. Distributed renewables such as rooftop solar have become increasingly cost competitive, particularly in sunny regions such as Australia, where retail energy costs rank highest globally. Within the Australian electricity market, a blockchain startup called Power Ledger identified an unmet opportunity at the intersection of high electricity prices, increasing distributed solar energy, and unattractive options for consumers to sell surplus energy. To serve the unmet need, they developed an eponymous technology, a blockchain-based peer-to-peer energy trading platform that enables consumers to sell surplus solar energy to neighbors without a middleman. Power Ledger enables distributed energy resources - particularly rooftop solar - to be shared more efficiently. Built upon their proprietary EcoChain blockchain system, described in their white paper, the platform allows energy producers - which Power Ledger calls “prosumers” - to sell energy to nearby consumers, providing both seller and buyer better economics by cutting out the middleman. Supporting the Power Ledger approach, both the the Australian government and one of Australia’s largest utilities, Origin Energy, signed on to sponsor multiple pilot projects. The former awarded Power Ledger an $8 million grant to deploy Interbit to monitor energy and water usage in the city of Fremantle, providing the “transactional layer” to a consortium of academic, infrastructure and technology partners. In the Origin Energy pilot, Power Ledger connected customers who wanted to either sell or buy excess electricity. In both cases, the Power Ledger blockchain digitized electricity, allowing consumers to trade it in the form of tokens called Sparkz. A sparkz represents a specified amount of energy, pegged 1:1 to the local currency, and is redeemable from the sponsoring utility or relevant authority. For example, electricity customers could trade one kilowatt-hour of solar energy for perhaps, 15 Sparkz, which would be redeemable from Origin for $A0.15 Australian dollars. 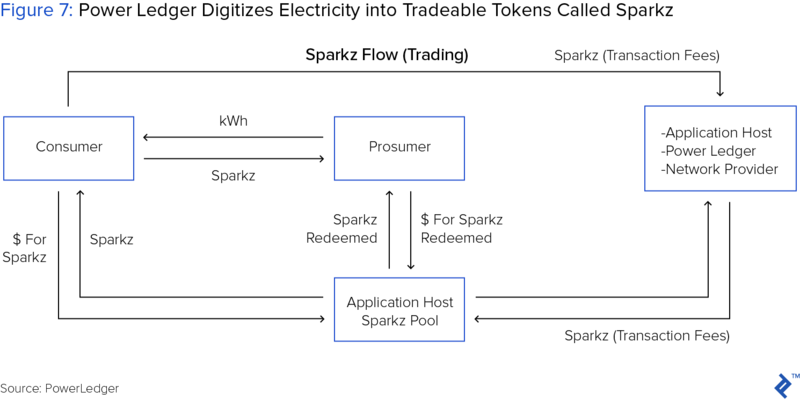 A seller who received Sparkz for energy sold to her neighbor could redeem Sparkz for currency from Origin. Based on savings data collected from early pilots, Power Ledger stands to massively impact Australian consumers. Results from a 2016 pilot suggest households could save $A600 annually - nearly 40% of the average 2017 bill - using Power Ledger. Capturing both the opportunity and challenge inherent in blockchain adoption, Marco Dunand, co-founder of Mercuria, a leading global commodity trader and BTL partner, described current trading processes - which blockchain stands to replace - as “pre-archaic.” Surely, executives from other transaction-intensive verticals witness similarly outdated processes. And while blockchain should relieve the byzantine document flows, Dunand acknowledged another imminent challenge: the legal obstacles of getting governing authorities to recognize blockchain. As such, as more industry leaders follow suit and invest resources into pilots, they should match investment in R&D with comparable effort in educating regulators, helping them comprehend - and ultimately endorse - the discoveries of their exploratory endeavors. A lot of fancy buzzwords and ideas here, but it is all still an extension of an old model. That model being to keep energy production in the hands of a few corporations who use large scale power plants which waste billions of joules of energy through transmission and distribution. Just think how much in resources could be saved if energy production was conducted on a model of individual site production. Each homeowner being responsible for their own production. It wouldn't work for people living in cities, but then cities would be better used as strictly places to conduct commerce not for living unhealthy lifestyles of cramped living spaces. People who live in cities will never experience natural living, caring for animals, or growing food in a garden. They live like mice in cages. Renewable energy can work, but not on the old mass production and transmission model. Yes, the opportunity to reduce reliance on outdated, inefficient transmissions is real. 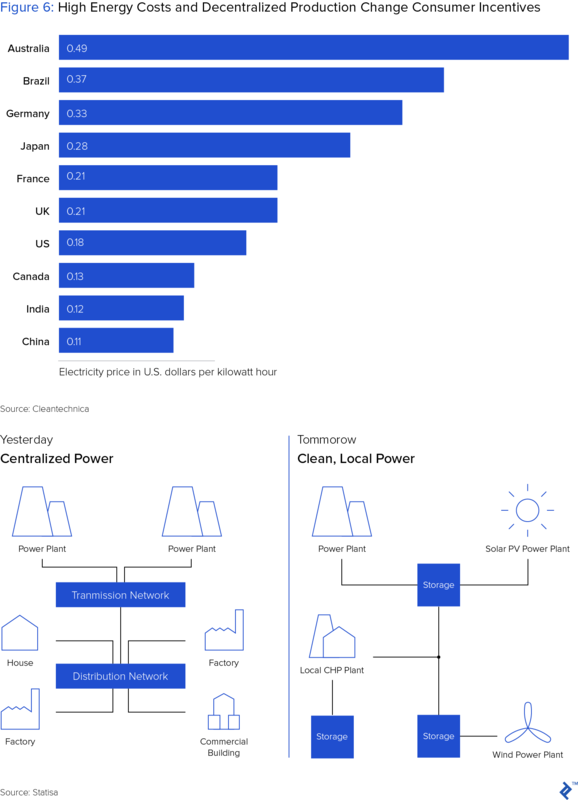 Hopefully increasing distributed generation, coupled with innovative methods for matching local supply and demand - such as blockchain-powered P2P trading - will accelerate the renewable trend. very nice article Matt...your linkedin profile doesnt seems to be working. Blockchain technology represents an important solution for preventing massive data breaches in the future. This article explores two possible ways this solution could manifest, profiling two ventures -- Blockstack and Civic. How are blockchain applications starting to help enterprises solve complex, costly problems? 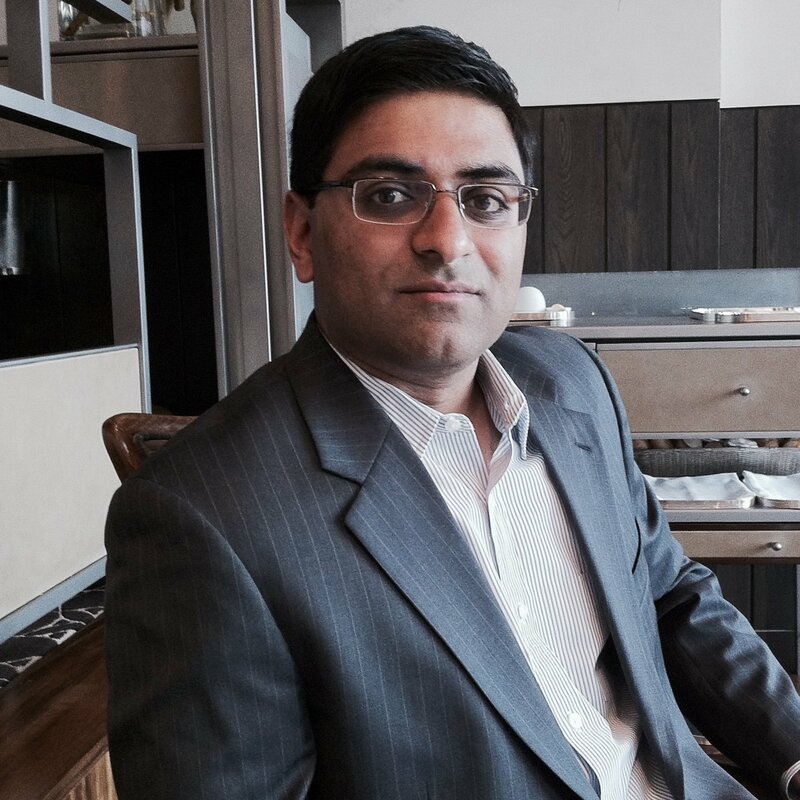 Saurin Patel, Client Partner at Toptal, provides a comprehensive, non-technical overview of blockchain as an enabling technology for the enterprise, and highlights recent use cases of the world's leading companies harnessing the fledgling technology's great potential.